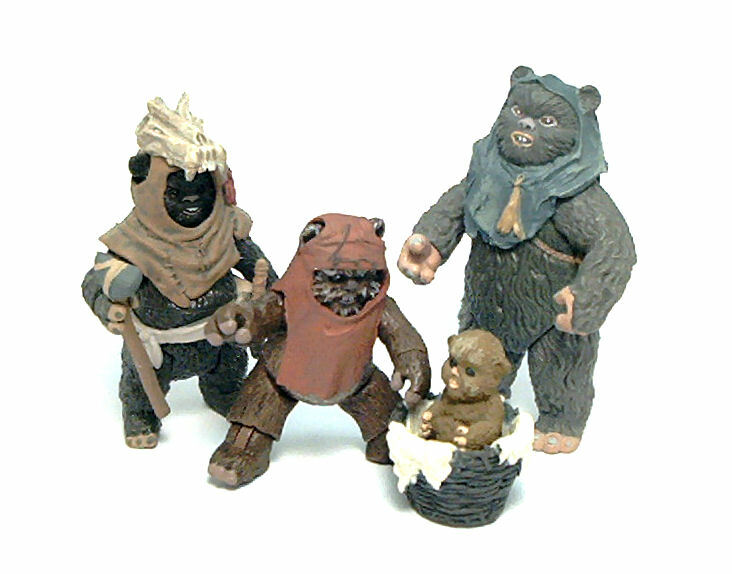 Back when Return of the Jedi premiered, I remember I did not hate ewoks outright. As a matter of fact, I remember it was something of a novelty for me to think about the technological disparity between the several planets and species within the Star Wars Universe. 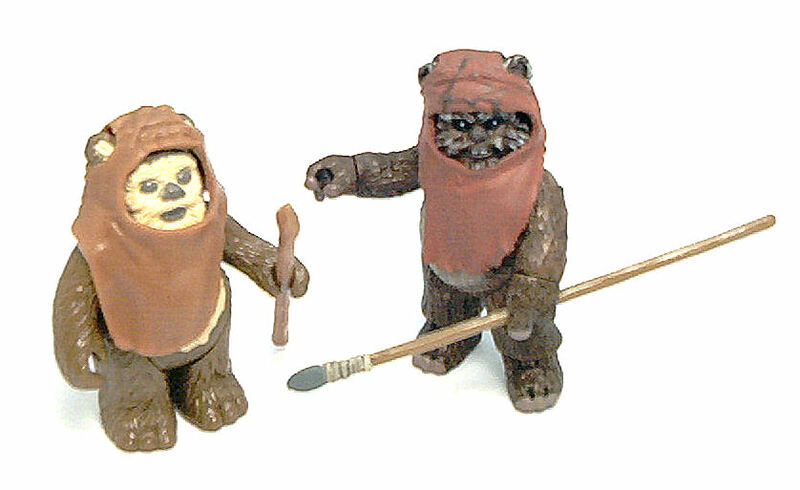 It was only after the ewoks had been merchandised to death that I kind of began to not like them as much, but by then I already had pretty much all of the vintage Kenner/Lily Ledy ewok action figures available. A couple of years afterwards, someone decided that Star Wars needed it’s own take on another insanely popular 80’s fad, The Smurfs, thus spawning the Ewoks cartoon by Nelvana Animation Studios and a whole new slew of items to buy based on the show designs. 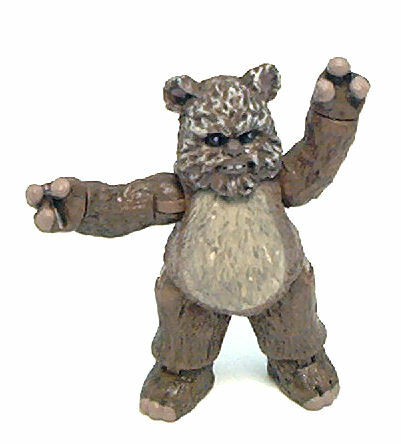 So, when it was announced that Wicket (VC27) would be included in the third wave of figures from the Star Wars Vintage Collection, I wasn’t chomping at the bit to get it for several reasons. 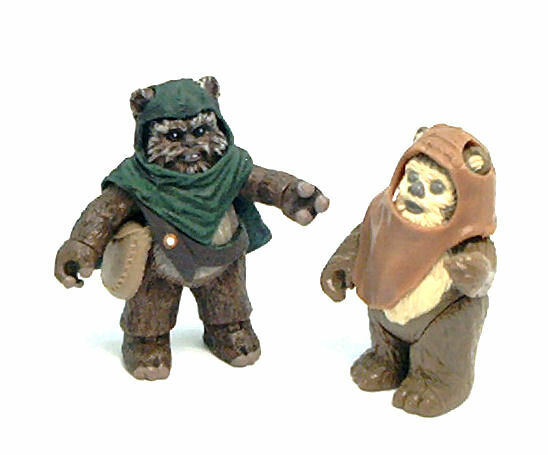 One was that I feel that the original vintage Wicket is still quite a good representation of the character, an assessment that prevented me from getting the Power of the Jedi version that came with Logray. 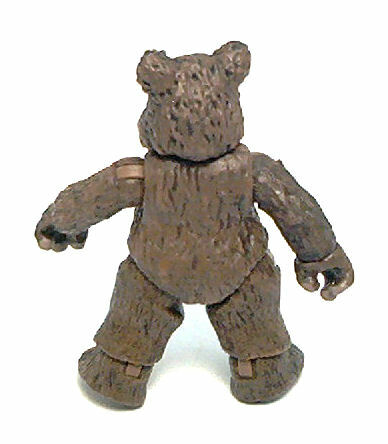 Another reason was that this new Wicket doesn’t come in a two-pack, something I kind of expected after the last few ewok offerings from the previous Legacy Collection. Even with the Gamorrean Guard providing some sort of plastic balance to this wave of figures, it just seemed silly to shell out the full price for an individual figure whose total mass, including accessories, barely matches that of a Princess Leia figure. However, figure prices had been oscillating at some stores (apparently Easter is also a big gift-giving season for kids), and I managed to find this Wicket at what amounts to a %25 discount over the highest retail price. Let me tell you, this figure would have been worth each and every cent of the higher price. So yes, Wicket is small, but it is also lethally adorable. From a technical stand point, the sculpture isn’t necessarily a very complex one because the little runt is covered head to toe in fur, and Hasbro sculpts fur like no one else in the business, but the proportions are spot on and the face has loads of personality. Likewise, the paint apps are rather simple, but extremely effective. The body doesn’t require much besides a slight shading wash and a lighter paint app for the tummy and a slightly different color for the tips of fingers and toes. The head has a starker highlighting on the face, pure white buck teeth and catch lights painted onto the glossy black eyes. • Hinged peg hips . Overall range is good on all the joints, although some limitations stem from either character design (hips) or from the way the accessories interact with the figure. 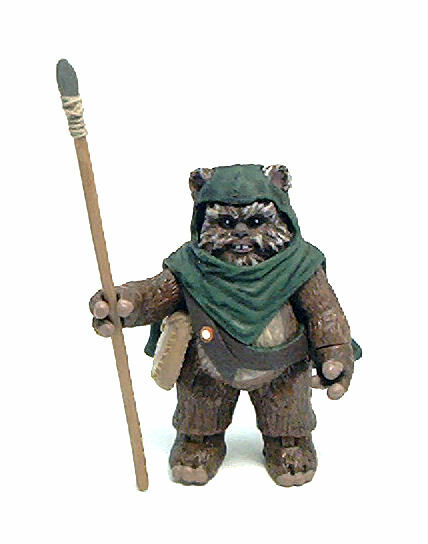 The selling point for Wicket is that he comes with his movie accurate leather cowl and spear, but also with a satchel and a green cowl like the ones he wore on the Nelvana cartoon. Both cowls are molded from the same green rubbery material, but the movie version was painted in a reddish brown hue, while the cartoon cowl has a shading wash applied to it, in addition to paint apps for the chest strap. In contrast, the satchel and the spear look rather plain, even though the spear has the stone tip painted gray and the strings that secure it to the shaft painted in a creamy color. I must say that I like the green cowl best; it just seems to fit better and has this layered feel to it that really makes the whole figure to pop out. The only downside is that it severely hampers the neck and shoulder articulation. The brown cowl isn’t as exciting to look at, but it does match Wicket’s appearance in the movie and allows for more posing options. 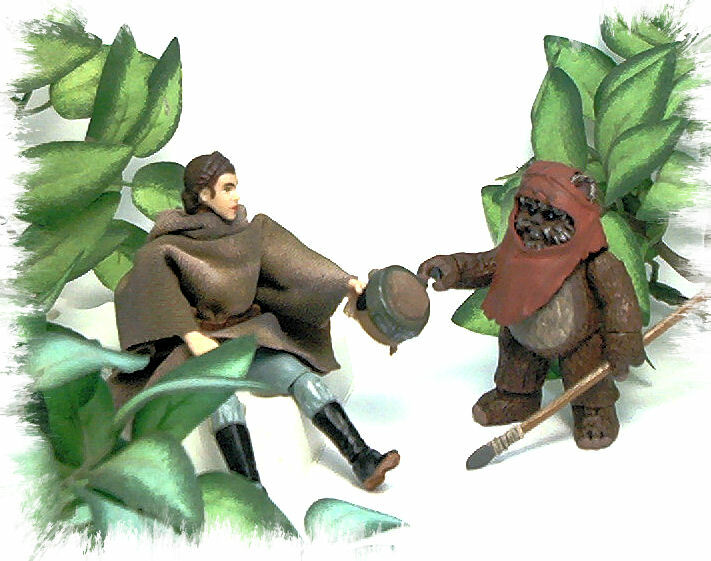 Either way, Wicket turned out to be a really nice figure to have, and certainly lives up to the claim of being the definitive version of him, animated or otherwise. I don’t know if I like the the way they painted the face. I always thought his face was the lighter color. 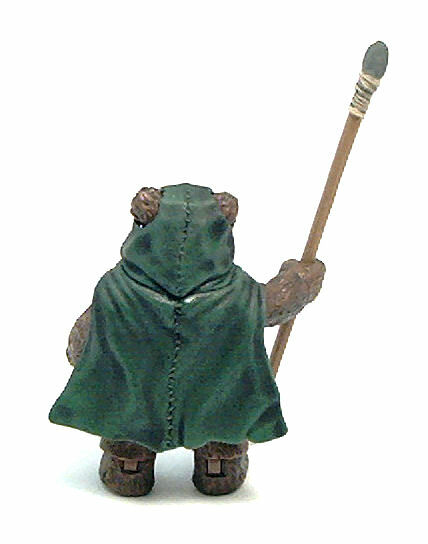 I have to say I am impressed with the “Ewoks” style hood/cape though. I like Ewoks. 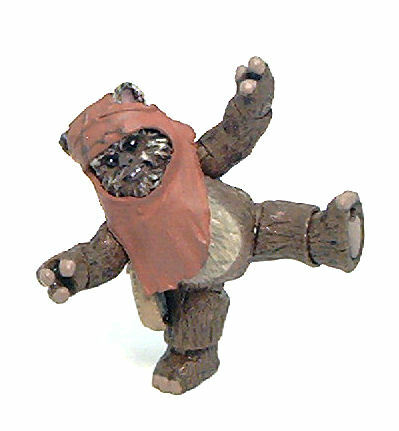 And Wicket here is the best one we’ve gotten ever in toy form.